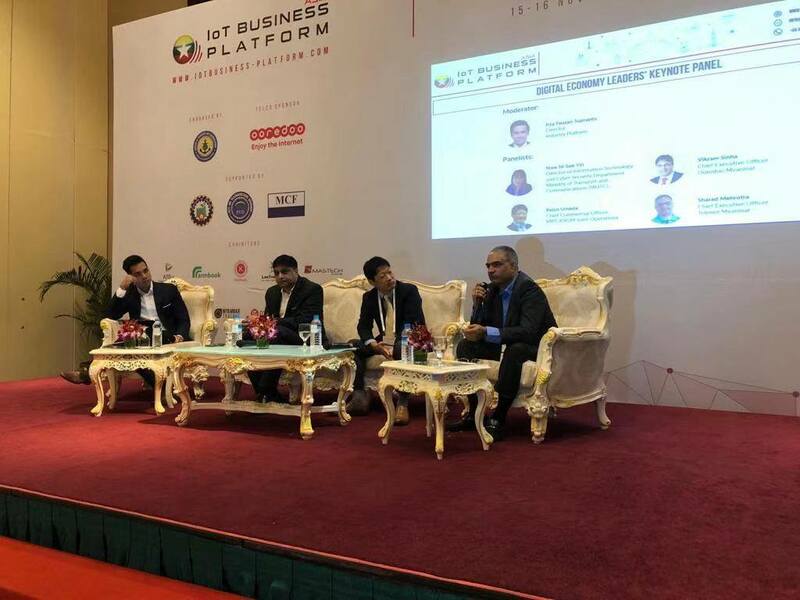 Yangon, Myanmar, 15 Nov. 2018 – Asia IoT Business Platform’s (AIBP) last activity in 2018 was hosted in Yangon, supported by the Ministry of Transport and Communications and the Ministry of Industry. This was the 2nd time Myanmar has hosted AIBP and we have seen conversations and discussion topics steering in a positive direction over the past year. 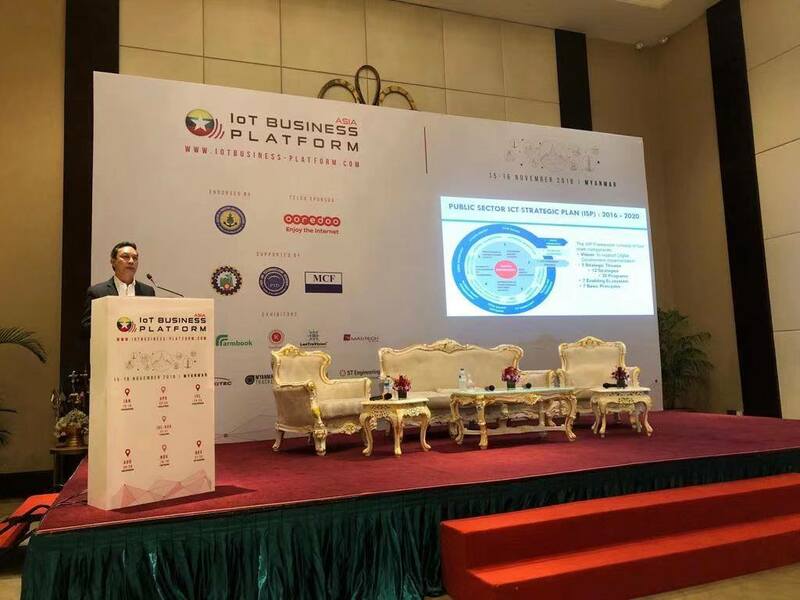 U Soe Thein, Director General of the Post and Telecommunications Department under the Ministry of Transport and Communications said in his Government Keynote Address today that “IoT, blockchains, AI, big data are the technologies in industrial 4.0 and are playing critical roles for the development of the various sectors, including health, agriculture, education & financial services”. He also mentioned that issues such as enhancing privacy, security, data rates, lowering latency and following global standards are the requirements that Myanmar needs to improve on for successful IoT implementation. In the keynote panel discussion, Reizo Umeda, Chief Commercial Officer of MPT-KSGM Joint Operations reflected that e-government, education and health are the top 3 priorities the country should be looking at now. Vikram Sinha, Chief Executive Officer of Ooredoo Myanmar stated the area of focus should be in agriculture, while Sharad Mehrotra, Chief Executive Officer of Telenor Myanmar thought IoT collaboration is needed between ICT solution providers and the local telecommunications companies. As the Telco Sponsor at this event, Vikram encouraged “Telcos do not need to do everything, we need to work on a partnership model. It’s extremely important that we tap on global and regional players to create an ecosystem and encourage local partners”. We heard the same call for collaboration from the Malaysian, Thai and Vietnamese key telco players and this indeed goes to show the genuine importance of external partnerships to enable progression and advancement in the digital development landscape, especially in a country like Myanmar when digital development is amongst the fastest globally. We will continue the discussions on day 2, 16 Nov., with a lineup of speakers providing different views on IoT adoption in varying industries. Finally, to conclude 2018, we have seen much excitement around not only IoT development, but also discussions and anticipation around trending topics such as AI, AR, big data and industry 4.0. Our role, as always, will be to explore commercial viability of such projects if/when adopted by local businesses in the region. If you're interested to learn more about Asia IoT Business Platform’s activities in 2019, please leave a comment below or email us at info@industry-platform.com.